1. 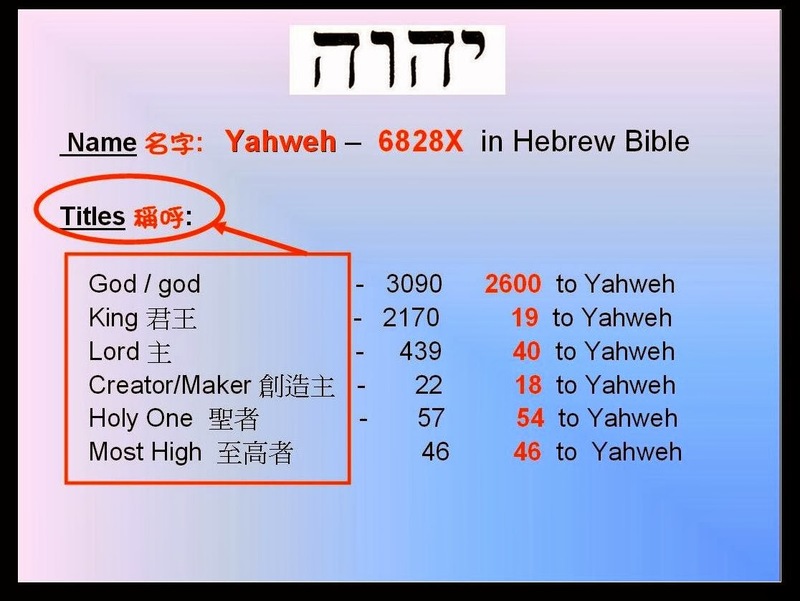 God's Name Yahweh occurs 6828X. 2. So far we have only studied a small part of God's Titles. The Titles are listed for you to see how frequent they occur in the Bible. The statistics vary depending on which English versions you use. Here, I am using KJV. 3. The statistics are not absolute but they give you an idea of where the emphasis is. Obviously the emphasis is on God's Name Yahweh rather than on His Titles. 4. The titles don't always refer specifically to God. 5. Even if you add up all the appearances of the titles, the frequency of occurrences do not compare to God's Name Yahweh. A name clearly identifies the person and makes it possible for us to establish a personal relationship with that person. A name is not a label, a concept or an idea. It's all about making contact. Through names, we BOND together! We are exhorted to call on God's Name and not His Titles. God also likes to call us by our names too. This journey with God is so exciting! !